This piece was created after my time at Blueberry View Artist’s Retreat in Benton Harbor, MI. I was transformed by the experience of making art in a new place, noticing local signage and imagery. I returned home and turned refreshed eyes to familiar places. 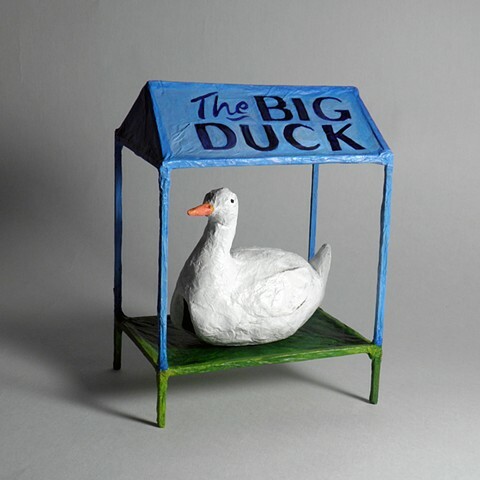 I chose to utilize the local architectural icon of duck farming history on Long Island: The Big Duck. Moved several times throughout its history, the duck-shaped structure is currently settled off County Route 24 in Flanders, NY, hence the inclusion of the road sign on the reverse of the roof. Stars are painted on the underside of the roof in reference to ancient paintings of stylized night skies reflecting the heavens beyond the temple ceiling, while simultaneously and humorously suggesting the footprints of ducks.